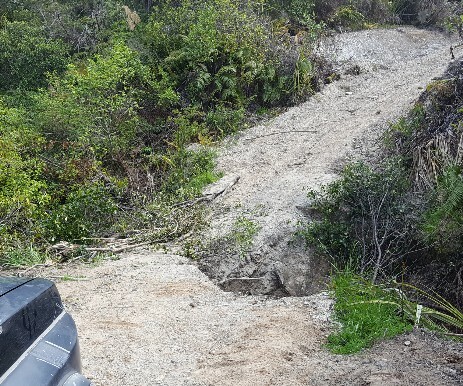 The Department of Conservation (DOC) confirmed on 15 February that work to repair the culvert damaged in last year's winter storms has been completed and access right through is available to 4WD vehicles. While very dry conditions currently exist, DOC advise that the route remains open, but care must be taken to avoid starting any fire. 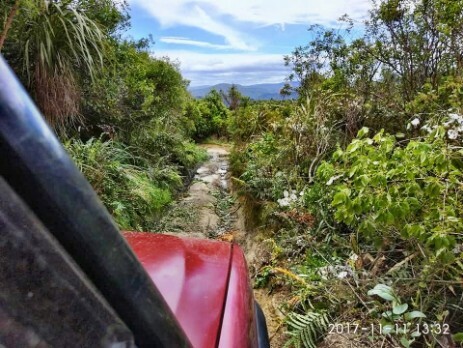 More than twenty volunteers converged on Owhango on Saturday morning, 17 November, to head into the 42 Traverse with the aim of cutting back encroaching vegetation. 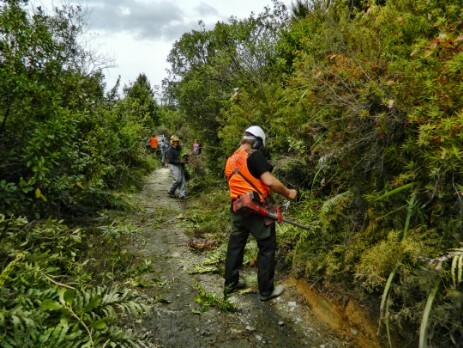 Armed with hand saws, brush cutters and pole saws, the teams managed to clear slightly more than six kilometres of track... a great effort! 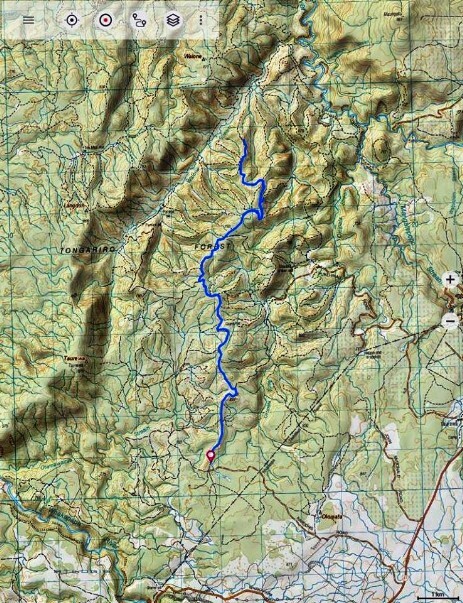 The recorded travel was more, as the group also did a preview of conditions further towards the Waione Stream. Considerable areas of Blackberry were found and a spray programme may be needed to control that weed. Wet conditions on the Sunday morning resulted in the cancellation of further work on the cutting back. At this date it is not possible to drive right through the 42 Traverse, as a significant culvert collapse is preventing 4WD travel at about a mid point on the route. The photo does not fully show the extent of the damage but this short bit of video does! The annual volunteer effort to cut back vegetation along the 42 Traverse route is planned for the weekend of 17 / 18 November 2018. These events provide an opportunity to contribute to the maintenance of this unique vehicle route and a chance to meet other enthusiasts. It is a long track and to make a realistic impression on the continually growing vegetation we need plenty of volunteers. Not everyone has to wield cutting tools... just as important are the teams clearing cut material off the track. Due to DOC health and safety requirements, unless you can meet their set standards, chainsaws will not be allowed to be used. In brief, the DOC requirements are the holding of Unit Standards 6916 and 6917, a current First Aid certificate, a safety plan in place and having completed an external competency assessment! If chainsaw work is needed it is the aim to have DOC staff available. Normally the route is closed in November to 4x4's, but DoC have allowed it over that weekend for those working on the cut back. http://www.skiclub.org.nz/bookings/nonmemberbooking Rate is $23 per night. DOC biodiversity rangers are in hot pursuit of ferrets which are hunting North Island brown kiwi in Tongariro Forest. At least 10 kiwi have been killed by ferrets since early March, and DOC has put extra resources into catching these predators. Disappointingly, a recent routine daily check of a key ferret trapping site showed a number of traps had been stolen, damaged or thrown over bank. Tongariro Operations Manager Bhrent Guy says DOC needs people to help catch these ferrets, and the best way to do that is to leave the traps in their strategic locations. He said rangers were shocked and dismayed when they found the traps broken and tossed. “It is a real shame, as one ferret trap can make such a difference,” he said. The Tongariro kiwi team have had some success in catching a large male ferret they believe has been hunting kiwi within its territory, however, the challenge continues as ferrets are still targeting kiwi. Owhango Alive (external site link), an active community group, continues to help save the kiwi and has put out over 30 new DOC 200 traps that were given to them by the rangers. Also, one farmer has caught 11 ferrets in the last nine months. Thank you to all the volunteers who gave their time and energy to help cut back some of the vegetation along the 42 Traverse. There were just over forty people involved over the 11/12 November and despite some logistics constraints with moving vehicles on a single lane track, the teams achieved more than expected... and without any injuries to participants. Over the two days, around 10 kilometres of the track was trimmed back on the Kapoors Road end. There is still some significant overgrowth along the overall track that will need to be addressed before too long and may need to be dealt with by some type of mechanical cutter. 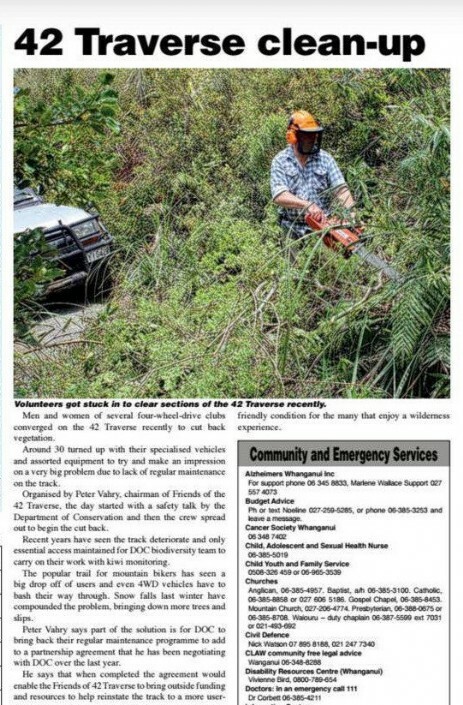 While it is ok for users to assist with trimming overhanging vegetation, it must only be with hand tools as it is illegal to even have a chainsaw in a vehicle without specific permission, while on DoC administered land! The Department of Conservation (DoC) has given permission for vehicle access over the weekend of 11/12 November for a cut back and agreed to allow 4x4's onto the 42 Traverse before Dec 1, for that weekend only. 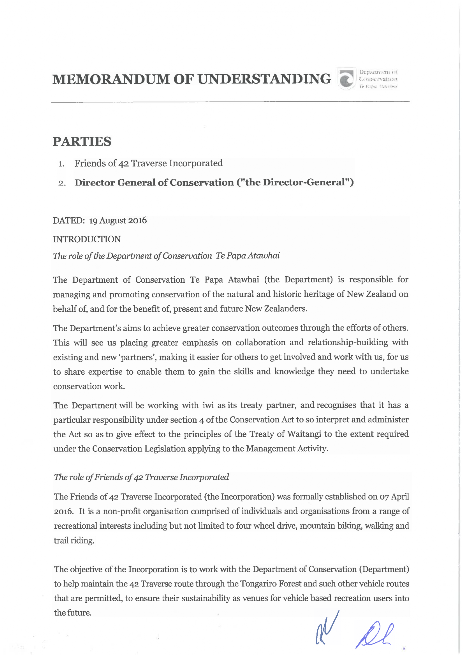 The plan is to try to get a really good number of people to tackle the vegetation along the stretch of track from the 'Lookout' down to the Waione Stream. We would start from the pumice pit on Kapoors Rd. Past projects have shown that teams made up of a chainsaw, a brushcutter and people clearing the cut material can be effective. Petrol hedgecutters are useful on Toi Toi etc. The use of slashers and machete's is not recommended, as they can be dangerous to use and create sharp points on cut branches that pose a risk of impaling people and tyres. Put together a team and come and give a hand. If you're able to assist, please email info@friendsof42Traverse.nz so that we have an idea of numbers. A quick survey of the 42 Traverse by a Friends of 42 Traverse supporter during late June identified that there has been significant water damage to old culverts, In some cases the water has scoured out the entire track while in others the track edges have collapsed. Wider vehicles like 4WD's will be unable to drive the route until remedial earthworks are done. The Department of Conservation advise that..." After the heavy rain over the past week some subsidence has occurred on the 42 Traverse. It looks like potentially an old log culvert that has collapsed or rotted away. The track is no longer passable by larger 4WD vehicle, but still passable by walkers/cyclists/quad bikes. 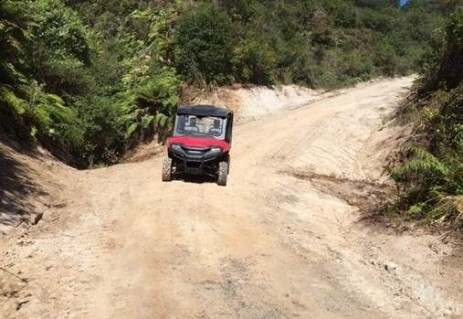 The track drops away down a steep bank on the other side so re-routing the track isn’t an option, this issue wont be fixed in the remaining 2 weeks of the 4WD season." 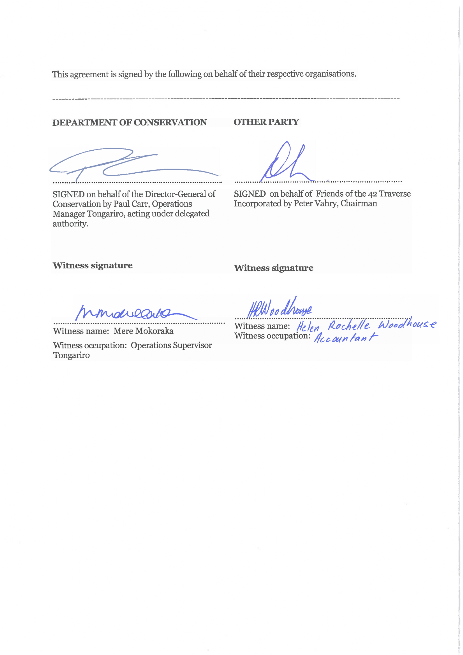 Friends of 42 Traverse welcome the joint signing of a Memorandum of Understanding (MOU) with the Department of Conservation. On 7 January 2017, a group of four wheelers documented some of their trip through the 42 Traverse from the Kapoors road end. It is obvious that some sections of the route are in need of the cutting back of the vegetation and to accomplish that we will need your help with funding.